Melodrama is not something we accept easily these days, tittering gently as the gore runs, moving restlessly in our seats as heroes or villains declaim to the gallery. So all the more odd, on the surface, that Sweeney Todd is the most popular of Stephen Sondheim’s musicals. On the surface. Because, under the melodramatic posturing, Sondheim creates a cold, hard, bleak world. So not a barrel of laughs, right? Well, no, not right either, for Sweeney Todd is Sondheim at his fastest, his most ferocious, and his funniest. 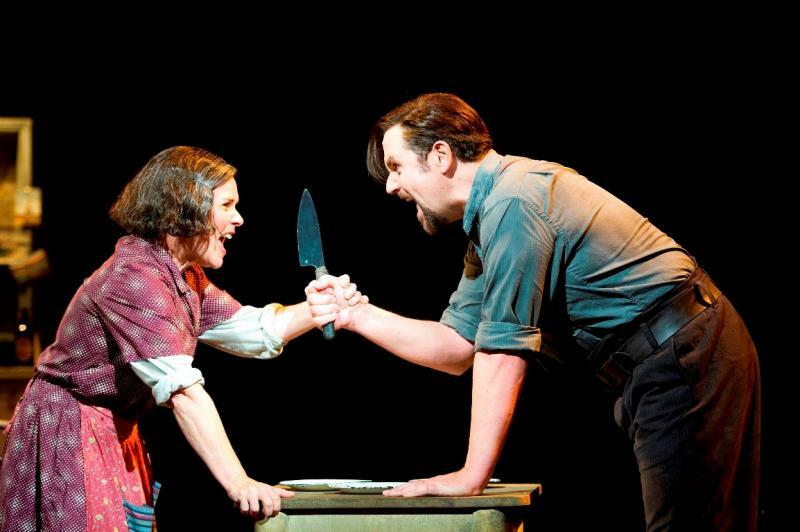 The melodrama of the returned convict Sweeney Todd (Michael Ball) cutting a swathe (literally) through society in a search for vengeance is offset, and enhanced, by his besotted but pragmatic partner Mrs Lovett (Imelda Staunton), who happily bakes his leavings into pies. The mad barber roars that he will be revenged, she checks that he has enough cash to get by: they are a team because they are emotionally deaf to each other. Mark Henderson’s genius smoky lighting fixes and focuses our attention as the action dots and darts about Anthony Ward’s splendidly grim industrial set, which gestures towards, perhaps, a semi-derelict warehouse, while his 1930s costumes update the original Victorian Sweeney to a Depression-era world, making sense of Mrs Lovett’s poverty, and the many drifting men who, unremarked, go missing after visiting the “tonsorial parlour”. Director Jonathan Kent keeps the complex action moving elegantly across the stage, using all three levels of Ward’s set to good effect as he marks out Sondheim’s shifting rhythms. There are no reservations, however, about Imelda Staunton (pictured above), who, theatre-goers have long known, is a Living National Treasure, and ought to be preserved by law. In “The Worst Pies in London”, Mrs Lovett’s introduction to both Sweeney and the audience, Staunton is willing to crack notes, to sing coarsely, in order to convey her character. Her “By the Sea”, the lovelorn pie-maker’s dream ditty of a little cottage where her swain can do the odd guest in, is heartbreaking as well as hootingly comic. In fact, Staunton, quiet, efficient and deadly, makes this production hers, all the while bearing an uncanny resemblance to Mrs Bones the Butcher’s Wife in Happy Families. But in the end it is Sweeney Todd, and Sondheim, that are the stars. It may sound pretentious to compare it to Alban Berg’s Wozzeck, but in musical complexity, richness of counterpoint, and sheer bloody theatricality, it is not far off. The Dies Irae that Sondheim uses as a leitmotif rings in the ears long after the audience has returned home. Sweeney Todd is King Lear without Cordelia. It is a world of no mercy, no compassion, a world that is, tragically, all too easy to recognise. This entry was posted in Journalism and tagged Journalism, Sondheim, Sweeney Todd, theatre by inspectorbucket. Bookmark the permalink.